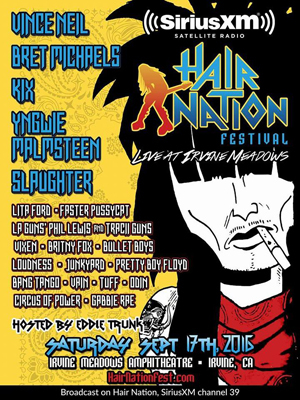 SiriusXM’s Hair Nation Festival is less than a month away, hitting Irvine Meadows Amphitheatre in Southern California on September 17th. Rock fans from around the globe are invited to re-live the filth of the Sunset Strip for one night only at the SiriusXM Hair Nation Festival. The event will be hosted by Eddie Trunk, and the music lineup features: Vince Neil, Bret Michaels, Yngwie Malmsteen, Kix, Slaughter, Lita Ford, Vixen, Britny Fox, BulletBoys, Faster Pussycat, LA Guns’ Phil Lewis and Tracii Guns, Loudness, Junkyard, Vain, Tuff, Bang Tango, Pretty Boy Floyd, Odin, Gabbie Rae, and Circus of Power. VIP packages for SiriusXM’s Hair Nation Festival have already sold out, but there are still General Admission tickets available at www.HairNationFest.com starting at just $15 (plus fees). Irvine Meadows Amphitheatre is located 8808 Irvine Center Drive in Irvine, CA and is less than two hours from Los Angeles, San Diego, Riverside and San Bernardino Counties. It’s also conveniently located a short drive from John Wayne Airport in Orange County, CA. For those traveling to the Southern California area to attend SiriusXM’s Hair Nation, there are a wide variety of lodging options in the Irvine area.